Привет! Я Ваня. Как дела? Pree-vyet! Ya Vanya. Kak dila? Hi! I'm Vanya. How are you? Привет! Я Катя. Очень хорошо! Pree-vyet! Ya Katya. Ochen ha-ra-sho! Hi! I'm Katya. I'm very well! Listen to what Vanya and Katya say to each other - and then try to copy them. When you've done that a few times you could try having a similar conversation with a friend. A Russian speaking pupil at Newbury Park Primary School gives you an introduction to her language here. (Newbury Park "Language of the Month" project). This is a short clip from a video taken on September 1, the day schools start in Russia. It shows first year pupils (aged 6-7) reciting poems to all the other children, teachers and parents. They are carrying flowers for their new teachers. Watch this short cartoon - can you work out what's happening? What does the wolf say at the end of the film? Can you guess what he means? ​﻿You can hear some Russian children talking about the poet Pushkin here. Find out more about Pushkin on Who was Alexander Pushkin? As you see, some Slavonic languages, like Polish and Czech, are written using the alphabet used by English, French and many other European languages (the so-called “Latin alphabet”). Others, like Russian and Bulgarian, use the Cyrillic alphabet, with a few small differences from language to language. 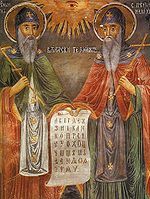 This alphabet is called “Cyrillic” because the story goes that two Christian missionaries from Greece called Cyril and Methodius first brought it to Russia in the 9th century. The letters are a mixture of “Latin” letters, Greek letters and other letters for the special sounds of Slavonic languages. One of the special letters is Ж which sounds like “zh” (the “s” in the English word “pleasure”). You will find others in the alphabet on the next page. Russian speakers: About 144 million people speak Russian as their first language - it is the 8th most spoken language in the world. Russian is also one of the six official languages of the United Nations. Russian is not only spoken in RUSSIA. A lot of people in some of the countries near Russia also speak Russian, mainly in addition to their country's main language. For example you might meet Russian speakers from Belarus, Estonia, Kazakhstan, Kyrgyzstan, Latvia and Ukraine and other countries as well as from Russia.